But what I notice as an historian is that two of these fake letters concern the same thing: anxiety about athletes flunking out. Both Jack Meagher, the coach, and George McCarble, a player, beg Santa for passing grades. It used to be quite easy for all students, not just athletes, to flunk out of Rice. Just the other day one of my colleagues in the Woodson showed me a long list of names of students who had been put on probation one semester, so long that it must have constituted a significant portion of the student body. Standards were both extremely high and completely inflexible, and after all, attendance was free so you didn’t lose any revenue when a student left. This was rough on everyone but in the 1920s the pain was especially felt by the athletes. Coach Heisman tried to keep more players eligible by taking over part of East Hall as a sort of athletic dorm but although the added discipline helped a bit, Rice kept losing both players and games. So in 1929, a new Physical Education curriculum was adopted in hopes of keeping more and better players on the field. Did it work? Eh. Not really. Things didn’t really get any better until Jess Neely arrived in 1940. Bonus: Spotted on campus yesterday. 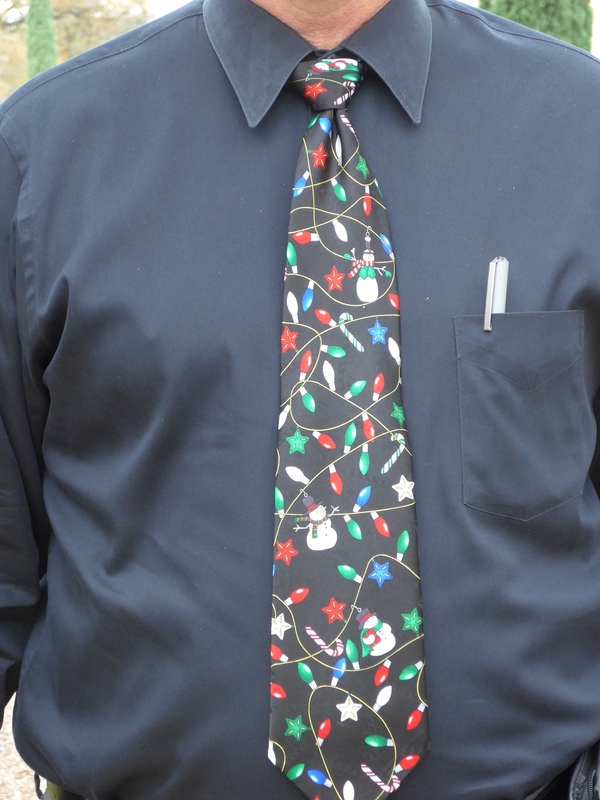 It’s a bold (and festive) man who wears such a tie. I’m guessing there is a back story to all of the actual names. I’m surprised to see a tie on campus this late in December. Maybe the gentleman in question was going to a holiday party. Yes, there’s always a back story. In my world even the back stories have back stories. As was mentioned, the physical education department was created in 1929. It lasted almost 70 years but no longer exists. In 1960, Jess Neely was instrumental in Rice creating the Commerce degree program as an alternative for those student athletes who wanted to pursue a business career instead of coaching. It was phased out in 1978 by a directive of President Hackerman. As popular as the business minor currently is among students, it would make a lot of sense to revive the Commerce degree and open it to all Rice students. As I recall Math 100 was the killer for many freshman students in that era (20s and 30s). As I recall it was Math 100 which lead to Howard Hughes departing Rice. During my time many SE freshman were killed by the combination of MATH 101/102, CHEM 101/102 and PHYS 101/102. (This was the default route, there were honors versions of math and physics had introduced a self-paced course). In addition you had two additional courses plus Phys Ed. It made for an interesting semester for many freshman. I remember the pumpkin grades that first semester were a shock. Has a bit of explaining to do with home. From the account in the 1991 book “William Ward Watkin and the Rice Institute” by Patrick J. Nicholson, Hughes did fail Math 100, but he left Rice to run his father’s company, Hughes Tool after his parents died. p. 295: “Young Hughes had attended Rice as an engineering student, enrolling for the 1922-1923 academic year shortly before his sixteenth birthday. * He managed to fail Mathematics 100, reportedly for lack of attention to class assignments rather than for lack of ability. His instructor was the memorable Miss Alice Dean, fellow in mathematics and assistant librarian, a post she held for a third of a century. Her freshman math course was the nemesis of most new students. *Note: The 2007 book “Hughes -The Private Diaries, Memos and Letters” by Richard Hack (pp, 47-51; https://books.google.com/books?id=emhBjp6-1wwC&pg=PA47&lpg=PA47) and a p.3 article in the March 22, 1978, Thresher (“Will Rice finds more enigmatic Hughes diary entries”; https://scholarship.rice.edu/bitstream/handle/1911/67228/thr19780322.pdf?sequence=1) say that Hughes was 17, not 16, when he entered Rice and it was during 1923-24. That is oh so easy to imagine. When Hanszen was the “Gentlemen’s College”, a “dark” tie was required at Sunday dinner (which was served at lunch). Paul Spikes found a very wide, light-colored plaid tie, wrote “dark” on it with a black Marksalot and wore it to Sunday dinner, It was reported that Masterson scowled, but never said anything about it. I think that tradition died in 71 or 72. When I got there the Sunday dinner requirement was a tie. At least two different individuals applied the ruleliterally. The rules only mentioned a tie being required so they showed up in only a tie. As I recall in one case they had obtained a very large gag tie but the other one was simply a tie.